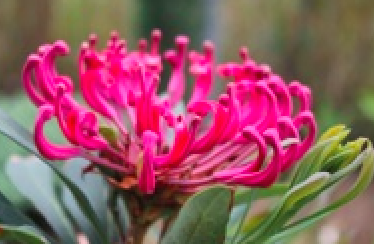 Waratah of Australia, this extraordinary shrub produces some of the most alluring flowers in the flower kingdom. A tall growing evergreen shrub with handsome leaves. In spring and often again in late summer crown shaped flowers emerge purple and open to circular red flowers at the branch tips. These are seedlings of Telopea x ‘Braidwood Brilliant’ which is a hybrid selected for excellent cold hardiness for the cut flower trade. Protea- which means you should avoid fertilizer and too much compost. Rich to average soils- pure loam is ideal in a protected location in full sun to part shade. Avoid reflected heat. Light summer water. Not the easiest shrub to establish but the care and patience are worth it in the end. Cold hardy to approximately 5ºF. Protect from subfreezing wind. Amazing cut flower that lasts for weeks in a vase- if you can spare a stem. Excellent performance at the Oregon Coast. To 12′ x 8′.